ESSA is involved in and supports a wide range of broader public health prevention and health promotion campaigns and collaborations. In relation to physical activity, ESSA participated in a national forum facilitated by the National Heart Foundation in 2015 with policy experts and key stakeholders to identify the main elements that would make up a National Physical Activity Action Plan. The result of this forum and subsequent online consultation was the development of the ‘Move More, Sit Less’ Canberra Communique. 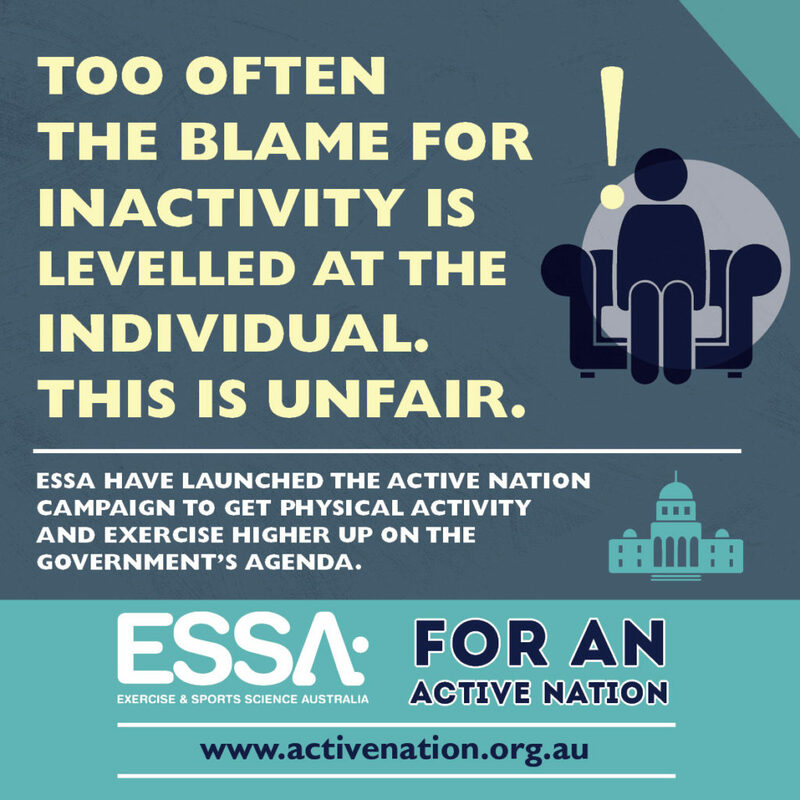 This document outlines a set of nine action areas and a co-ordinated set of policies that governments and political parties can easily take on board and allocate funding towards getting Australians moving more and sitting less. ESSA joins over 20 other organisations across government and the public health, education and community sectors as a proud signatory to this document and calls for a Federal Government National Physical Activity Action Plan. The World Health Organization’s (WHO) goal to reduce physical inactivity by 15% by 2030 has been highlighted in their recent Global Action Plan on Physical Activity 2018-2030. WHO’s plan encourages countries to increase levels of physical activity through strengthening their response with evidence-based policy solutions, guidelines and implementation tools. 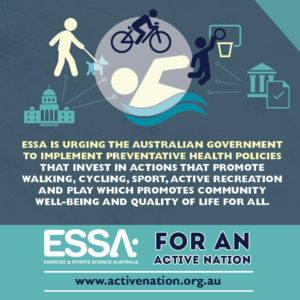 ESSA is urging the Australian Government to implement preventative health policies that invest in actions that promote walking, cycling, sport, active recreation and play which promotes community well-being and quality of life for all. Accredited Exercise Scientists (AES) play a significant role in prevention and health promotion. However, these solutions to combat physical inactivity globally, especially in Australia, requires a whole of government approach. With the release of the recent National Sports Plan by Sport Australia, it’s encouraging to see that the Australian Government is aware that an increase in physical activity is needed, but the implementation of a Federal Government National Physical Activity Action Plan is now vital. With 50% of Australians having at least 1 of 8 common chronic conditions (cancer, cardiovascular disease, mental health, arthritis, back pain, lung disease, asthma, diabetes), and 23% having at least 2 or more, $467 million is spent on health every year. That’s $19 per person, per day. 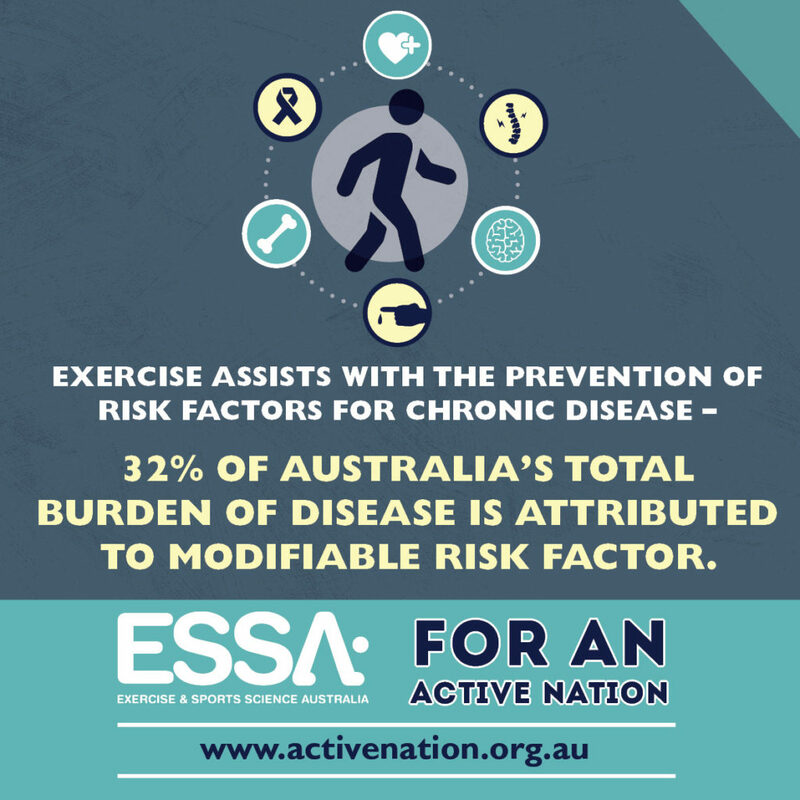 Although the leading causes of death in Australia ranges from coronary heart disease, to dementia and Alzheimer’s, and lung cancer and lung disease, most are preventable with exercise assisting in the prevention, management and treatment for all conditions. There’s no denying the benefits physical activity has on the health and well-being of all Australians. Physical activity assists in reducing the burden of disease, mortality and morbidity, and improves social interaction and community networks. 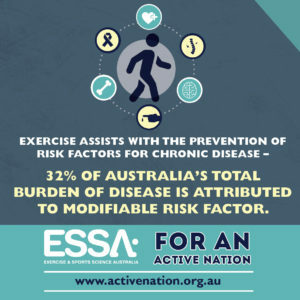 Exercise assists with the prevention of risk factors for chronic disease – 32% of Australia’s total burden of disease is attributed to modifiable risk factor. Physical activity also increases endorphin release, improves mental health and can prevent or reduce the impact of mental health conditions, as well as reducing stress and anxiety. An Accredited Exercise Scientist provides an evidence based practice approach to exercise and promotes and delivers individualised exercise programs to assist in preventing risk factors of chronic disease and promoting health. The future of Accredited Exercise Scientists will be best placed in environments and work places such as active transport, corporate health, health promotion, community health projects, but the Australian Government has an important role to play in initiating support to implement these community partnerships. Too often the blame for inactivity is levelled at the individual. 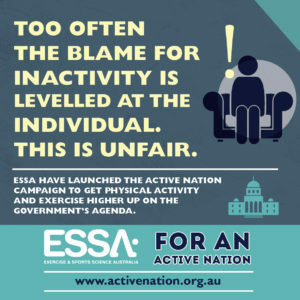 ESSA have launched the Active Nation campaign to get physical activity and exercise higher up on the government’s agenda and promote the benefits of the general public working with Accredited Exercise Scientists for prevention and health promotion.